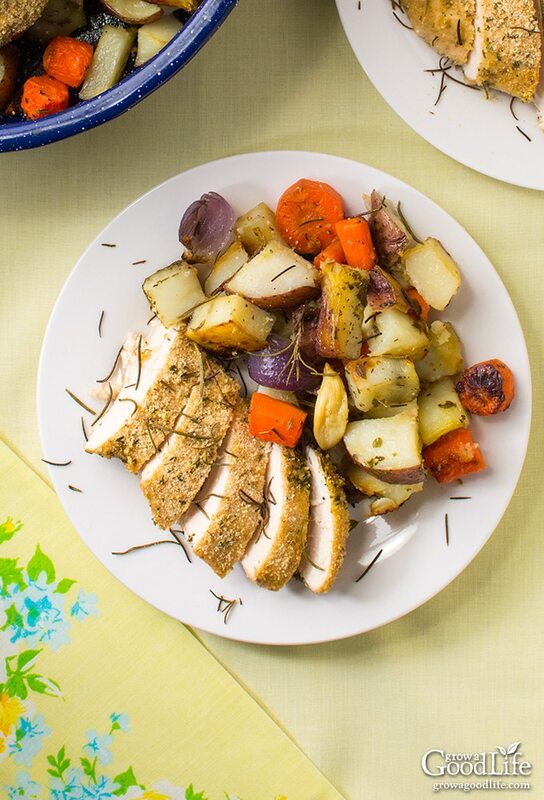 This one-pan, roasted rosemary chicken and vegetables recipe is an easy to prep meal bursting with flavor. Something extraordinary occurs when vegetables are roasted. The high heat crisps up the outside of the vegetables and locks in their natural flavor. Then that flavor transforms, sweetens and intensifies as it roasts. I usually make different variations of roasted vegetables at least once a week in my kitchen using whatever vegetables are available. It is never the same meal twice. I try to roast up a big batch, so there are plenty of leftovers to enjoy throughout the week. The variations to this meal are endless and can change with the seasons. You can include whatever vegetables are in your harvest basket for that day and easily experiment with different herb combinations. Root vegetables: 30-45 minutes: Try roasting beets, butternut squash, carrots, garlic, parsnips, potatoes, pumpkin, sweet potatoes, turnips, rutabaga, and onions. Winter squash: 20-45 minutes: Cube up some acorn, butternut, delicata, Hubbard, or pumpkin squashes and roast until the edges are slightly brown and caramelized, and the insides are soft and sweet. Brassica vegetables: 15-20 minutes: Cut into similar size florets and pieces and try roasted broccoli, Brussels sprouts, cauliflower, kohlrabi, and radishes. Roast to your desired crispness. Soft vegetables: 10-20 minutes: Slice or chunk up some asparagus, peppers, summer squash, zucchini, and eggplant, Also try roasting whole cherry tomatoes until they are bursting with flavor. Roasting vegetables is easy. Simply wash, chop into similar-sized pieces, add to a roasting pan, and season with salt, pepper and herbs of your choice. Drizzle the vegetables with some olive oil and toss until they are evenly coated. Spread out the vegetables, cover with foil, and pop it into the oven. This recipe includes lightly breaded chicken. Skip the chicken for a meatless variation. Place your chopped vegetables in a large roasting pan. 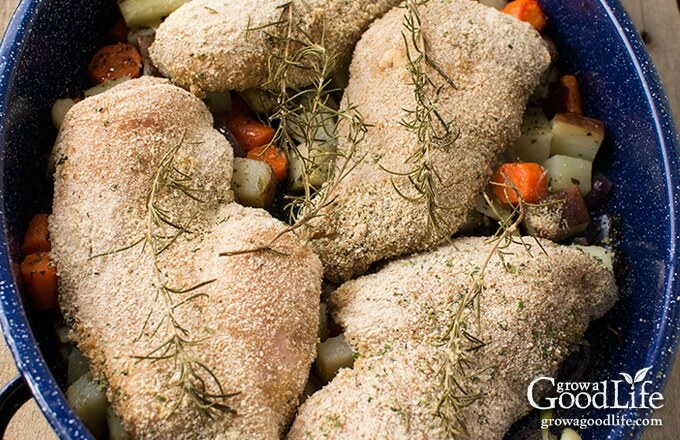 While vegetables are roasting, dredge the chicken pieces in breadcrumb mixture to coat. After the vegetables have roasted part way though, add the breaded chicken pieces on top. Continue roasting until the vegetables are soft and the chicken is cooked through. Preheat your oven to 425˚F. 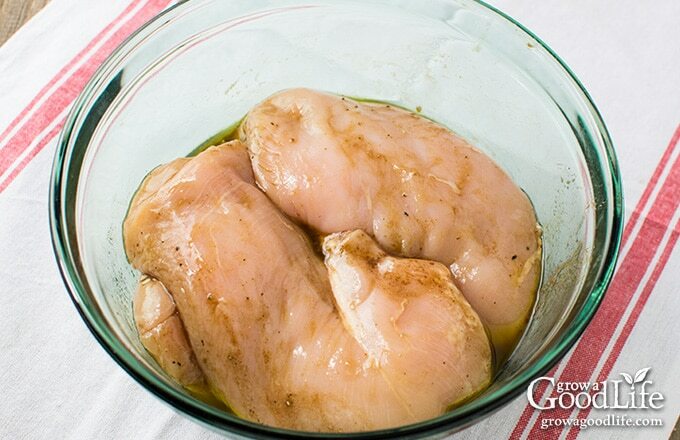 In a medium bowl, whisk together 2 tablespoons of olive oil, 1 tablespoon of vinegar, and a dash of salt and pepper. Add the chicken breasts to the bowl and stir to coat. Cover and refrigerate. Place all your chopped vegetables in a roasting pan. Drizzle with olive oil, sprinkle with half the Italian herbs, pepper, salt, and toss to coat. 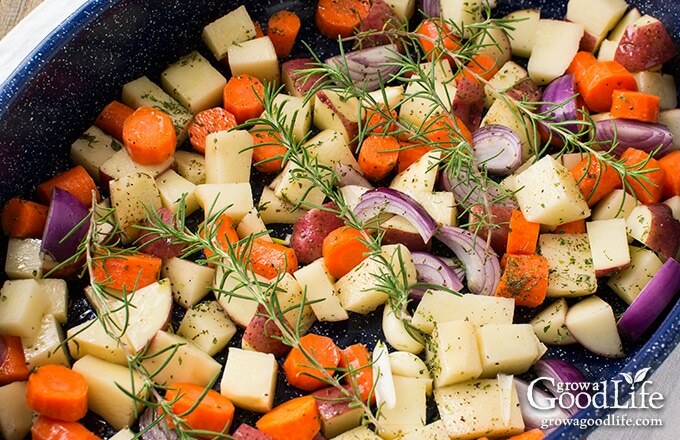 Spread out the vegetables evenly in the pan and top with rosemary springs. Cover the roasting pan with foil and place in a preheated oven for about 20 minutes. While vegetables are roasting, place the breadcrumbs in a shallow bowl, add the remaining Italian seasoning and stir to combine. 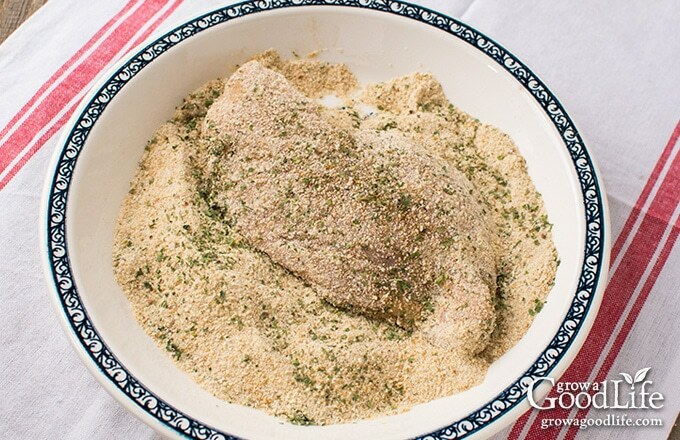 Dredge the chicken pieces in breadcrumb mixture to coat. Set aside. After the vegetables have roasted for 20 minutes, remove the pan from the oven, remove the foil, and stir vegetables. Add the breaded chicken pieces on top. Continue roasting uncovered another 25-35 minutes or until the vegetables are soft and the chicken is cooked through. Strip the rosemary leaves from the sprigs. Slice the chicken or serve whole with the vegetables. Serves 4-6. Cut your vegetables into equal sized pieces so they cook at the same rate. Don’t crowd the pan. Spread the vegetables out in your roasting pan, so they have a little space in between. Crowded vegetables will create extra moisture and steam in the pan. Stir partway through so the vegetables brown on all sides. Check on the vegetables frequently while roasting. Some cook quicker than others. This post was originally published in November 2014. It has been updated with additional instructions and photos. Ingredients include 6 cloves of garlic, however in the method, you do not mention them! I decided to include them in both. Chicken and veggies. Delicious, thank you. Elizabeth, The garlic should be included with all the other vegetables in step 2. Although I bet the garlic was good with the chicken too! You can’t go wrong with garlic. 🙂 I am glad your enjoyed the recipe. Thanks for coming to my last Fabulous Friday Party, you are a feature for this Friday and loved the roasted vegie recipe congrats! Thank you so much! I will be back this Friday. Mountain Man was looking at the shares on Homestead Blog Hop (thanks for sharing) and he said this is a MUST for me to make! It looks so delicious, hearty, and good-for-the-soul. This looks so healthy, simple and delicious! You’re right – roasting vegetables brings out the best flavors and texture. I pinned your recipe to save so I can try it for my family. Love this! 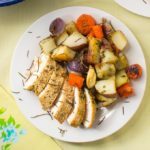 Roasting vegetables is my favorite way to prepare them and adding the chicken is a perfect bonus to making it a one pan meal with easy cleanup. Thanks for linking up on Wake Up Wednesday! This looks absolutely amazing. I love anything with carrots, but I haven’t tried roasting them in a while. Pinned this one! This looks delicious! I love roasted veggies! Thank you for sharing at the Art of Home-Making Mondays this week! My husband isn’t much of a squash fan… but I wonder if he would like it in this… hmm.. thanks for sharing this recipe! I bet he would! Roasting squash makes it nice and soft and a little sweet. I like the idea of a mix of summer and winter squash. This recipe looks like a keeper! Thanks so much for posting it. Oh this looks delicious! I can only imagine the way it makes the house smell. I like roasting vegetables too. I like that they are sweeter when you use the higher heat. I love roasted veggies. I finally made some the other day. The first time of the season. Yum. 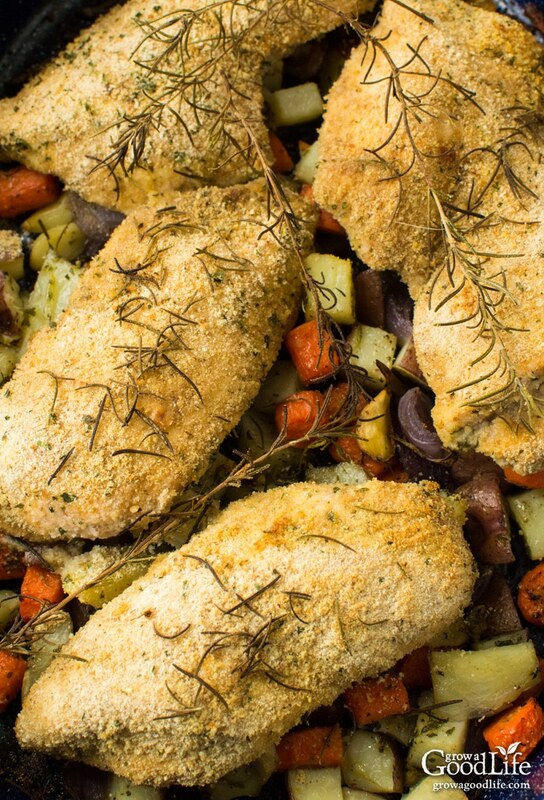 That sounds yummy – cooking the chicken on top of the veg makes a great one pan meal. I’ll definitely be giving this a try. I love roasted vegetables. I roasted some carrots last night, tossed with a little olive oil, garlic and salt. Oh, this looks so good. Just need to put the ingredients on my shopping list. Hope you have a great day. Sounds like a healthy hearty meal and I love all the vegetables and spice you added. Thanks for sharing on Real Food Fridays. Pinned & twitted.